Premium bases for eLiquids from Germany! Only the best liquid bases for your e-cigarette! Every e-juice consists of a base and a flavoring of your choice. There are countless flavors and, when blended, the possible combinations are endless. With our DIY bases you can create stunning and unique liquids. Your creativeness has no limits. We offer easy-to-mix base kits as well as single ingredients for bases. 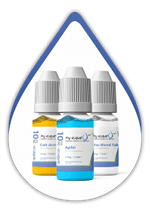 By adding nicotine solutions you can adapt your preferred nicotine level. Maybe you have always wondered how that certain flavor combined with another tastes like…now it is your time to start DIYing! At the beginning you might think DIYing e-liquids is some kind of magic. But it’s just as much magic as baking an apple cake. If you know how and have your ingredients ready you will soon rule that DIY thing! So what are you waiting for? Start experimenting today! What do bases consist of? All our ingredients are made in Germany and according to the German Pharmacopoeia. This security of our products guarantees you safe fun. The base of a liquid mainly consists of propylene glycol (PG) and vegetable glycerin (VG). This is called the ‘diluent’. This diluent is necessary - for the additional nicotine and the flavoring are highly concentrated and need to be diluted. PG and VG are also the carrier fluid making up most of the base and providing taste and clouds. Few people are allergic to PG. 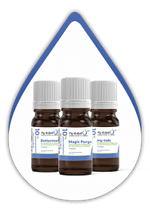 In this case you can simply choose polyethylene glycol (PEG) instead of PG. PG and VG are chemical compounds that are widely used in daily life, e.g. in personal care products or pharmaceutical products. They are not classified as harmful and are just perfect for vaping. Which PG/ VG ratio is best? 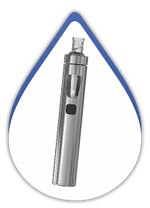 The ratio of PG and VG depends on your vaping habits and what effects you desire when vaping. While PG carries the flavoring and doesn’t alter the taste, VG is slightly sweet but generates dense clouds. So if you are not that into great vaping effects and cloud chasing but more and unaltered taste increase the PG part. Keep in mind though that PG can sometimes deliver a throat hit which causes cough and throat irritation. High VG however is commonly used by drippers because it makes a smoother throat feel and produces more impressive clouds. Typical ratios are 70/30, 50/50 or 30/70. Don’t be afraid, take your time to find out what ratio is best for you! Vaping habits can be just as individual as preferences for food or clothes. Therefore, there is no ‘perfect’ nicotine level. It depends on your smoking habits, whether you are about to make the switch to vaping or whether you want to reduce nicotine step by step. For those who want to switch from cigs to e-cigs we recommend to maintain your used nicotine level at the beginning. If you are/ used to be a heavy smoker (up to two packs per day) you might be happy with 18mg/ml. About 15 cigs a day make a 12mg e-liquid. Always keep one thing in mind: nicotine is addictive, toxic and can cause severe damages. If you are a non-smoker stay that way and chose a nicotine free liquid or base. Can I save money by DIYing? Yes, you can! At the beginning you may be surprised by how much you invest in your equipment compared to just one pack of cigarettes. There is a very wide price range of e-cig hardware. But the higher the price the longer the product will live. If you have smoked one pack of cigarettes a day, multiply the price by 7 for a week: nice dinner, huh? Wanna face the truth by multiplying the daily price by 365 for the whole year? Quite an impressive holiday that has gone up in smoke… your liquid costs nearly as much as a pack of cigs but lasts for about two weeks. If you decide DIYing your own bases you will save even more! Quit smoking today and start vaping - for your health and for bank account.